You Dared Me… I Did It! This Top Was $5.99 from Rite Aid! So, if you follow us on Instagram… the picture below is how the challenge to style this top all got started. I was in Rite Aid and I couldn’t help but notice these throw back popcorn shirts in a $5.99 bin as I approached the register. THEY POPPED. For some reason, I had to have one! So when I instagrammed it, a few of my Gal Pals thought so too! Shout out to Polished for Pennies Gal Pals @amberbucci and @_browboss for initiating the challenge, because being a Polished for Pennies Gal Pal is knowing you can make ANYTHING look like a million bucks and feel great about it too! So I hope you can see through this post, just what being Polished for Pennies is about! Finding the potential in ANYTHING ANYWHERE and using a little confidence and flare to sell it! Even if it’s only costing you about 5 bucks! 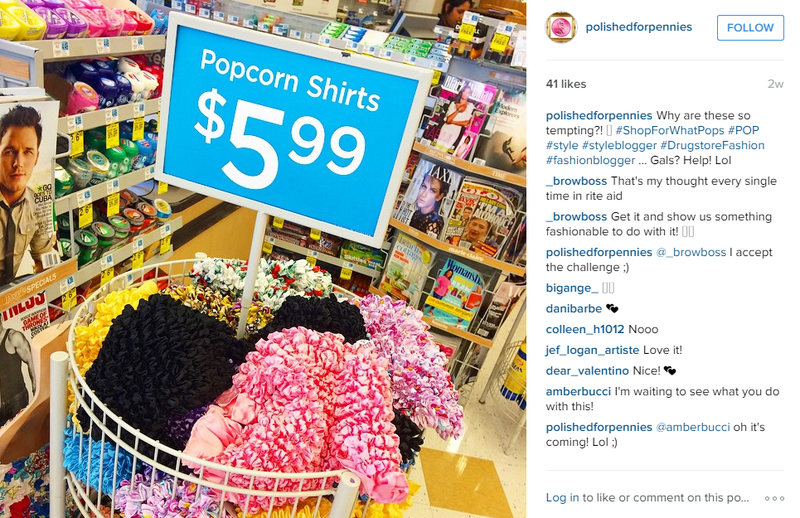 So that’s what I tried to do in this post with this peach popcorn top for $5.99! I didn’t want to pick the black one figuring you would think I chose the easy way out, so I thought the peach was super pretty and a great color to accentuate a tan in the summer and feel fresh! So I mixed it with a Cynthia Vincent light peach and light weight vest from Marshalls, vintage Fendi thrift-found bag, HEAVY IS LUXURY pearl and stone cuff that I got for $1 at JOMAR (Not kidding), light denim jorts, and shades and laser cut heels from Sole Society! To be honest Gals, I feel great about this! It’s fresh for summer, hot with style, and I don’t think anyone would assume the cost of the top when your rich with confidence! That’s Polished for Pennies! TIP* The key to making something cheap look rich? Find harmonious colors to pair with it, add more expensive pieces to up it’s luxury flare, and rock that baby like there’s no tomorrow! Would you make this POP-Corn top POP?